This page is meant as an information resource for tips and tricks during physical activities at cold temperatures. Experience was collected by servicing a meteorological station in the taiga near the village Zotino at the Yenisey River, approximately 800 km north of Krasnoyarsk. We stayed in a tent for two weeks at outside temperatures reaching -55°C, and had to do daily service tours on skies to two different meteorological stations. Due to repeated material failures at these extreme temperatures, it was hard physical work to keep generators running, constantly having to repair electronic devices and generators, and to keep electric circuits and computers working. More experience about physical activities came from Andy's Greenland bicycle tour - cycling on the frozen sea for three months at outside temperatures reaching -47°C. 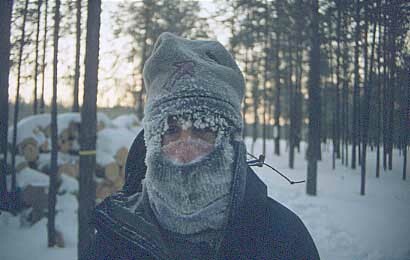 How to deal with very cold temperatures? Wie geht man mit Kälte um?